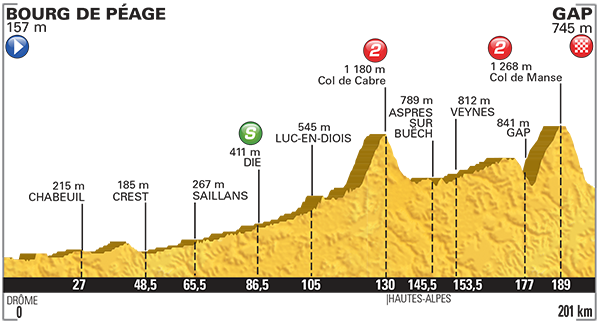 This stage is on the up from kilometre zero, with the first descent from the cat 2 Col de Cabre at 130km. It’s gradually uphill again until the last 30km, which is a double-descent whammy into Gap, with the Col de Manse climb in between. With descending possibly the only weakness that Chris Froome has, it’s likely that Sky will hold the peloton on a tight leash, even attacking on the final climb to ensure that they’re the first of the GC on the descent. His rivals will want to take advantage of these descents to try to gain whatever time they can on him – remember how Alberto Contador tried to put distance between himself and Froome in 2013 (and unfortunately crashed in front of him)? The final descent is technical at the best of times – if there’s any rain, it could be a hair-raising experience for them (and for us)!